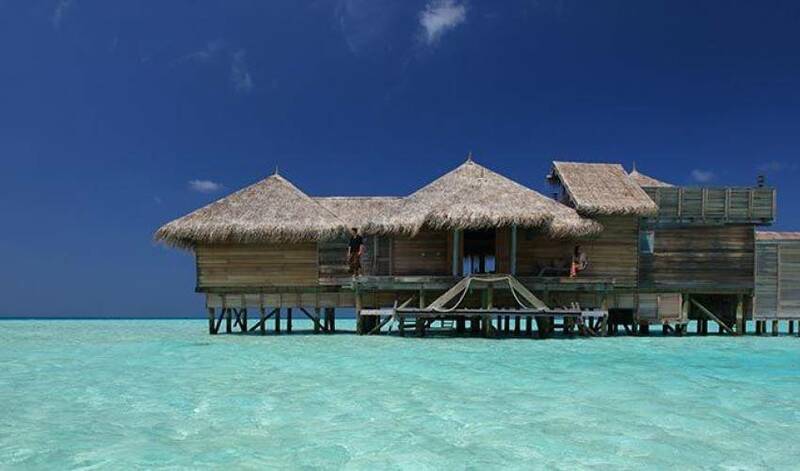 Located over-water either side of a jetty, the Villa Suites reflects a harmonious life on the water’s edge. Sit back and relax while looking out to the sea, basking in the sun on your own ‘over water’ sundeck or enjoy your luxurious private oasis on the hidden rooftop sundeck with daybeds as well as dining facilities. The villa is designed with the utmost attention to detail, and built to be environmentally friendly. Your own private water garden and sun deck, as well as a separate shower linked to your bathroom by an open-air walkway allow you to live right by the water’s edge. 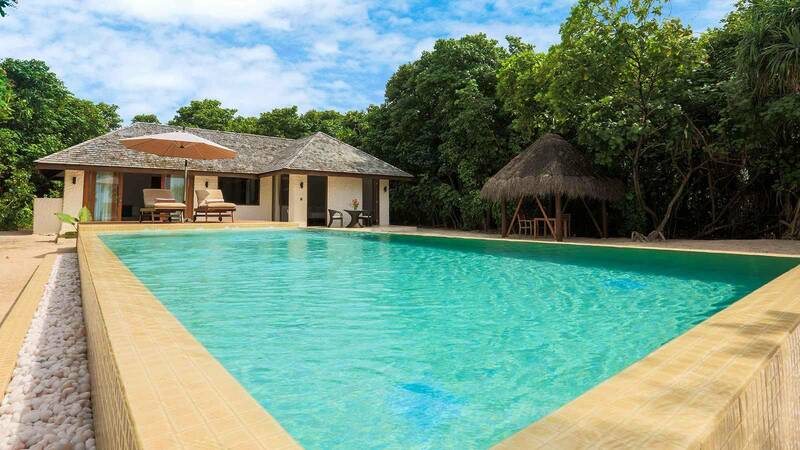 This luxurious villa in the middle of the Indian ocean is an intimate coral island in a sparkling lagoon, with jetties threading across the water out to spacious villa accommodations. Everywhere you look, marine life abounds. And the gleaming waters beckon. 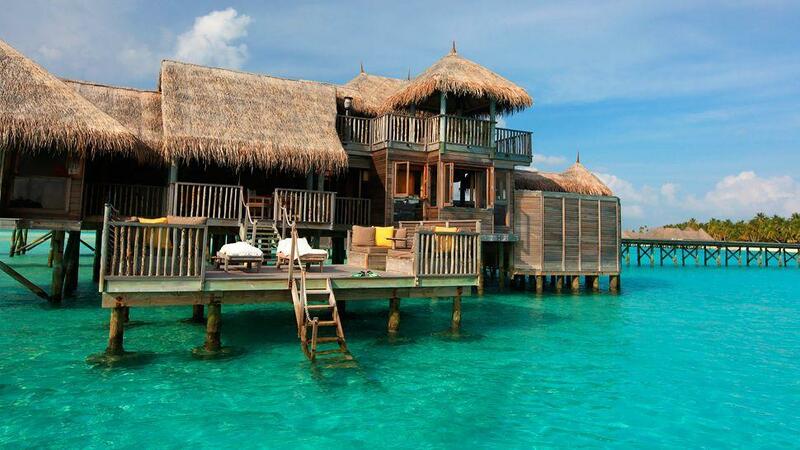 The Villa is set on a private island in the North Malé Atoll. 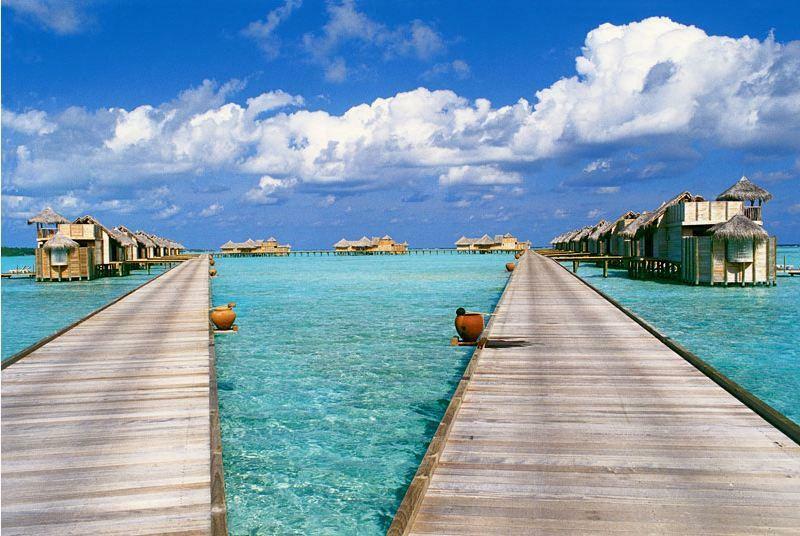 This luxury resort is just a 20-minute speedboat ride from the International Airport at Malé, the capital of the Republic of Maldives. 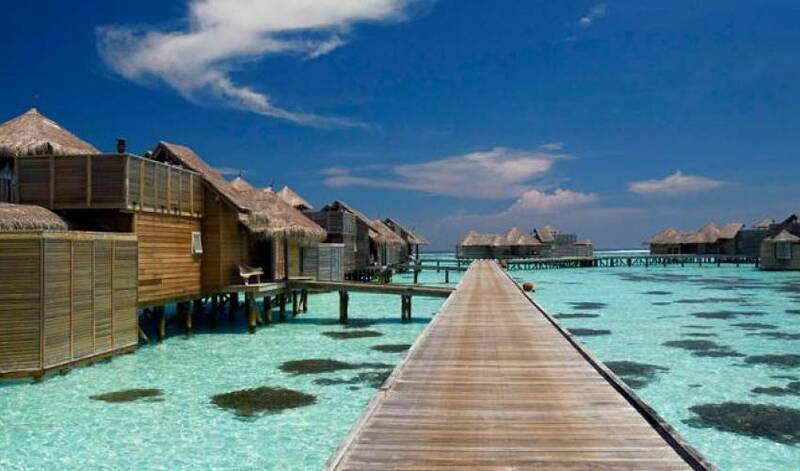 This 5-star resort is set on the private tropical island in the Malé Atoll, one of the 19 atolls that stretch over 800 kilometres through the Indian Ocean. 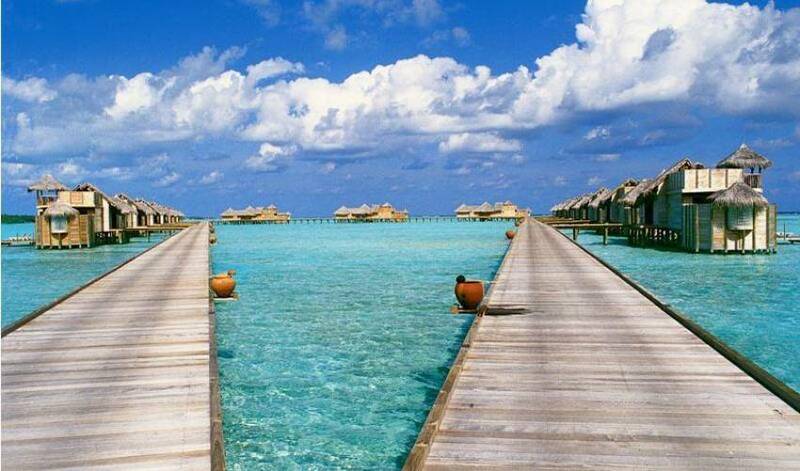 It is one of the 1190 islands that make up the Maldives. Luxury dining comes in the form of a private dinner on this secluded island. The cuisine will whet your appetite with fresh offerings and local produce, while the extraordinary settings will leave an indelible impression. The surroundings are teeming with marine life and the resort has its own fully-equipped padi diving school plus a variety of water sports. This place tops the list of must-do destinations for those in the know. In the Sanskrit language, Meera means ocean, and that’s where you’ll find our spa – built right over the sea. The sound of the lapping waves and the beauty of the sweeping views will set you at ease the moment you step in. At Meera Spa, you’ll find yourself relaxing and unwinding amidst the best that nature has to offer. Make yourself comfortable on the massage table, and you’ll be treated to views of underwater life through the glass windows beneath. Aches and knots are magically soothed away, thanks to an artful combination of therapies from all over the world; these draw on the healing wisdom of age-old cultures and are infused with modern know-how to rejuvenate your senses, calm your mind and uplift your soul. The Bamboo Massage is excellent for reducing stress, working out knots and loosening up tight muscles. This therapy utilises bamboo rods of different sizes and warmed aromatic oils for a sensory experience. If you’d like to try other indulgent massage treatments, you’ll be spoilt for choice with the extensive massage selection; the Tibetan Singing Bowl Massage, for example, is just perfect when you’re seeking balance and serenity. Harness the power of the sea with Voya Organics – an exclusive seaweed-based range that is used in Meera Ocean Therapy. Hand-harvested seaweed is blended with the best of certified organic ingredients for detoxifying treatments that support skin regeneration and renewal, increase circulation and promote healing with minerals. Therapies range from body polishes to seaweed leaf wraps to seaweed baths, and are based on an age-old sailor’s cure for skin and bodily ailments dating back 300 years. Put your best face forward with Sodashi – a luxury skincare range that is used in Meera Facial Therapy. Therapeutic-grade essential oils and plant actives regenerate the skin and impart a deep sense of wellbeing to spirit and mind. When combined with a facial massage, ingredients such as flower petals, organic herbs and earth clays heal and nurture our skin. Drop by our Spa Boutique and take the Meera feeling home with you. Our boutique features an exclusive selection of products from Voya Organics and Sodashi, while the newly launched Meera Lifestyle offers a home spa range that includes chakra crystal jewelry, silk sarongs, beach caftans, lavender eye pillows, handmade ceramics, environmental aromas and body products made with Meera signature essential oil blends. To complement our highly-trained international spa team, Meera Spa also has a Masters in Residence programme. Throughout the year, we present visiting holistic practitioners and renowned healers to provide additional wellbeing services. All specialists have their own gifts to offer and some of these include sound therapy, crystal therapy and craniosacral therapy, among many other alternative healing methods. Savour grilled seafood over the water, sip champagne in a traditional dhoni as the sun sets, or venture into the underground cellar for a unique dining experience. Luxury comes in the form of a private dinner on a secluded island. The cuisine will whet your appetite with fresh offerings and local produce, while the extraordinary settings will leave an indelible impression. Our ‘No News, No Shoes’ way of life will have you slowing down your pace and taking the time to appreciate the gifts of nature. A spa session feels extra relaxing with the sound of waves and a view of what’s underwater. 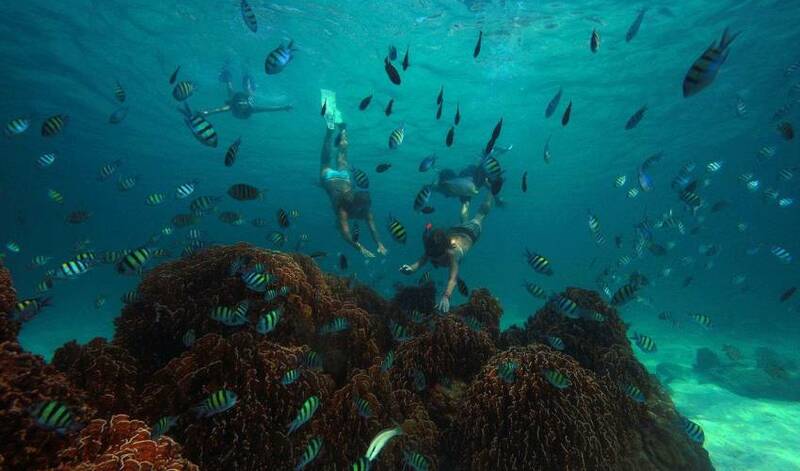 Diving and snorkelling yield amazing stories full of marine creatures. Even a leisurely afternoon enjoying the sea breeze seems all the more invigorating. The Ocean Paradise Dive Centre’s multilingual PADI instructors as well as the small dive group sizes ensure that guests of all experience levels get the best service at all times. This PADI dive centre is equipped with the latest equipment, while many renowned dive sites including world famous Manta Point are within a 10-minute boat ride from the resort. The fitness centre is located at the water’s edge amidst greenery gives a panoramic and clandestine view of the ocean seen through glass walls. Natural elements are used in the décor, with lighting and ambience to complement the surroundings. An iPod dock further enhances your regular workout, completing this exhilarating experience. Tended by our own garden team, the organic garden provides many of the fresh fruits, salads, herbs and mushrooms for our kitchens. We boast the best rocket in the world! There is a selection of easy reading and reference books. Guests can also use the desktop computer with complimentary internet access, as well as the attached printer. Wireless internet is available here, at the Bar and all guest villas. Superb handicrafts, clothing items, curios and souvenirs are all available at our Gallery, which is located adjacent to the Library. Adjacent to the Gallery, you’ll find Sifani, our island jewellery boutique, which is open daily from 9:30am to 1pm and from 4:30pm to 10:30pm. Picture this…A table dug into perfect soft sand, huge cushions, a swimming pool along side, a hermit crabs view of the ocean as the sun gently descends over Lankanfushi lagoon, lanterns flickering, the smell of charcoal drifting across the beach, a wonderful sense of the world at your feet, sand between your toes. Then, picture your waiter bringing you a series of beautifully decorated dishes inspired by the Indian Ocean, lit by alifanfenda (fire). Our shaded garden table is discreetly positioned within the Organic Garden, a sensorial feast of amazing aromas from exotic herbs and fruit and lush foliage. This is ‘Leaf’, our new dining experience in which we serve a menu inspired by the garden. Choose either a barbecue or zero carbo menu. 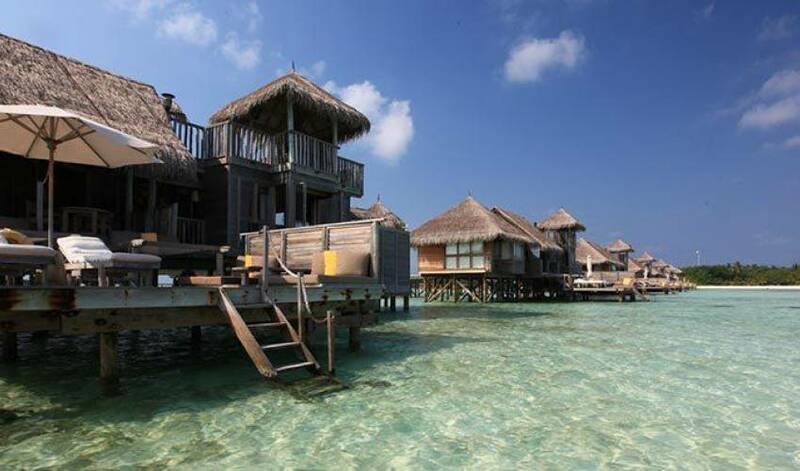 One Palm Island is the iconic location in this unique overwater resort. The ultimate desert island retreat with only one palm tree, now with its own jetty and cushioned seating. By day it is the perfect place to laze and bathe as you watch the local ‘dhonis’ (boats) go by; by night it becomes the most romantic place to dine in the Maldives, illuminated with candles and lanterns. Sit at our west-facing table and blend into the sunset, before enjoying a bespoke barbecue with premium cuts. Enjoy a sensational Japanese tasting menu and world class sake on a quiet, east-facing beach between our overwater spa and ‘By the Sea’ restaurant. Intimate is the word that best describes this experience with just you, a table, a couple of loungers and a swing and the best Japanese food for several hundred miles in any direction. What is your favourite film? How about watching it in the open air, surrounded by dense tropical foliage while dining on a Hollywood or Bollywood themed dinner? This must be the ultimate movie/dining experience - Watching the ‘stars’ beneath the stars. Our elevated dining area in the Organic Garden enjoys stunning 360 degree sea and garden views with a menu designed to challenge the senses. The table is carefully positioned to make the most of natural breezes but also to ensure absolute privacy as you watch the dying embers of the sun and toast the unexpected pleasure of the day to come. A Bedouin-inspired dining experience set on the vast Palm Beach. Recline on Arabic style low level seating before enjoying an authentic Arabian menu including lamb cooked in the ground, a style of cooking that is also a traditional Maldivian method. Wine tasting: For a less formal daytime experience, sheltered from the sun, join our sommelier in the cellar for a wine and chocolate or wine and cheese tasting. Gourmet Wine Dinner: Our subterranean Wine Cellar makes for a spectacular dining venue. (It is chilly down there, so we provide fleeces and hot water bottles). To help you explore a small proportion of the 700 World class wines available, we serve mouthwatering dishes with wines personally selected by our sommelier. Remove one sense and the others are heightened. That is the intriguing theory behind our blindfolded dining experience. It begins at your villa, where you are picked up by buggy, blindfolded and taken to a secret destination to enjoy a gourmet dinner while blindfolded. Flavors dance across the tongue to dazzle your taste buds. Every mouthful is served by our waiters so you'll never know if your fellow diners are messy eaters! Each villa will enjoy the services of a dedicated Mr Friday™ – so named after Robinson Crusoe’s loyal assistant and dear friend. Available 24 hours a day, your Mr Friday, or Ms Friday, will be delighted to help arrange excursions, spa appointments, sunset cruises, restaurant reservations and even help pack or unpack your luggage. Parents will be pleased to know that Mr Friday can also keep the little ones entertained with storytelling and craft sessions.